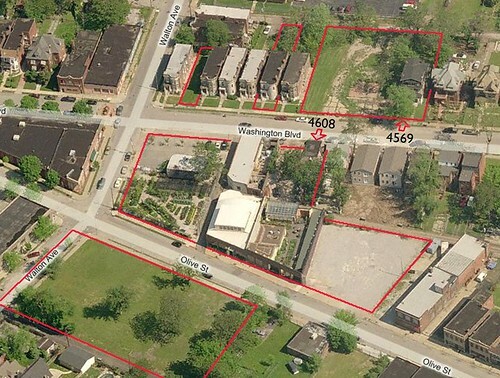 The St. Louis Preservation Board voted this afternoon to require rehabilitation of 4100 DeTonty as part of a larger redevelopment proposal to build new houses on adjacent vacant land. 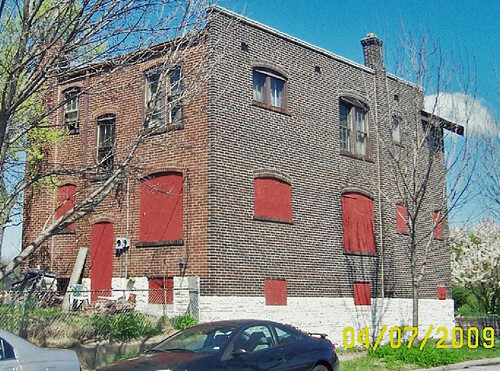 The applicant, Delmar Enterprises LLC had proposed demolishing the home for new construction. 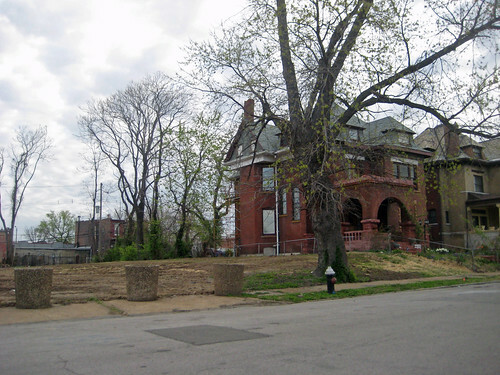 The house lies within the Shaw Historic District, making it eligible for Historic Tax Credits. The would-be developer however showed his lack of experience with rehab when he testified that saving the home would be unfeasible because he would need to re-build the front porch and would not be able to match the unusual brick. Funny thing is that if the house were demolished, the brick would be salvaged, sold for re-use, in other words use the same brick to re-build the porch (if it needs re-building). to have a new house here with siding along Thurman? Photo from Geo St. Louis. Fortunately, the preservation board did not buy the argument and in fact even did some quick math for the developer showing that rehab would be feasible with what the $200,000 estimated he would need to put into it, the 25% Missouri tax credit, and the estimated base sale price of $250-275,000. The new construction designs do not look too bad, although the windows are too small and the porches are not well proportioned. See the proposed designs here on the Preservation Board agenda. 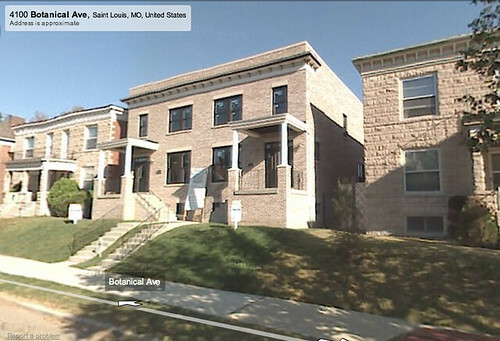 Above are some townhomes that Delmar Enterprises completed just before the real estate crash, and as you can see the porch columns are too tall, and the entire porch roof is too high. Also, notice how there are more windows on this design than on the newly proposed design. The real interesting thing about this proposal though is that the vacant land on DeTonty is still owned by Millennium Restoration & Development. 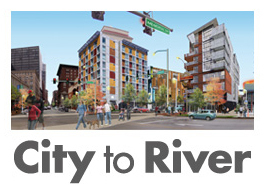 Their development director first found out about this proposal on a post a few weeks ago by Dotage St. Louis. It seems that Alderman Conway went behind their back with another developer, who by the way mentioned at the meeting that he does not have financing in place. Don't you just love St. Louis politics?! 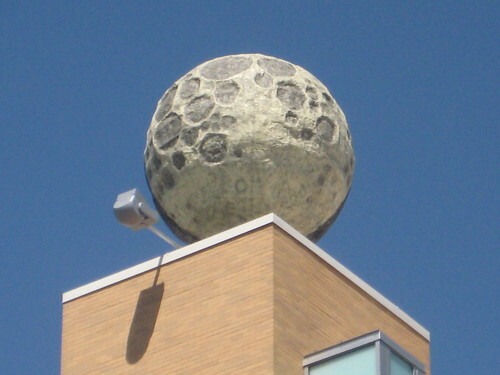 It seems fitting that the new Moonrise Hotel opened less than a week after Easter. 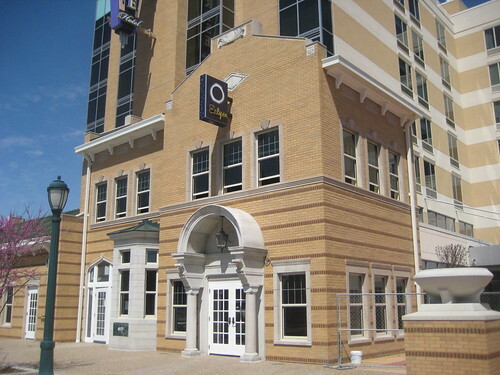 The front of the hotel includes one of the few instances in St. Louis where a complete of a portion of a historic building was "resurrected" following demolition. 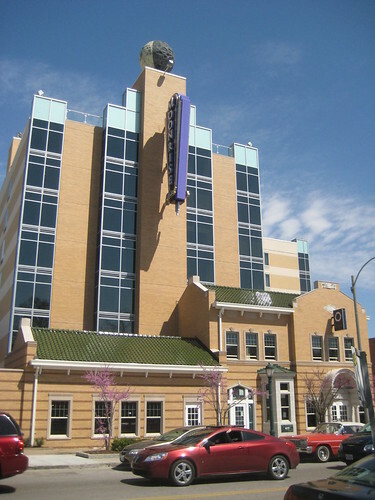 Above is the finished re-construction with the new hotel towering above and below is a photo prior to demolition of the original building (photo from the August 2007 Preservation Board agenda). The former building housed the Ronald L. Jones Funeral Chapel. The two story portion was constructed in the early 20th century, with the well matched one story addition dating from I believe the early 1980's (there had been a small plaque on the corner of the addition with it's date of construction). 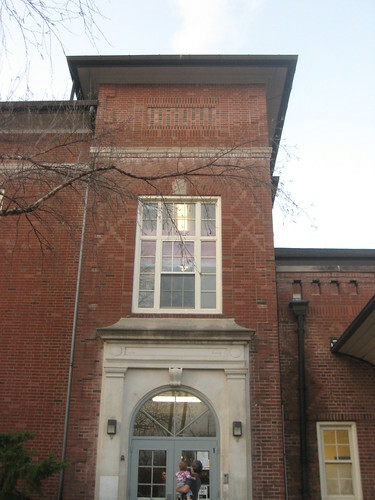 During demolition of the building many of the stone and terra cotta elements from the entrance, bay window and some decorative elements near the roof were salvaged and incorporated in the new construction. The re-construction included new brick and a green tile roof matching the original. Some elements were changed slightly including the windows flanking the entrance, at the one story portion as well as the size of the windows on the second floor. There are differences in the parapets including wall thickness and the awkwardly wide portion at the top of the front parapet where brick had to be used to fill in around the original terra cotta element. Overall though the re-construction is pretty true to form and most people will never notice the slight errors. While there are varying opinions about the merits of reconstructions such as has occurred here, there is no doubt that the "historic" portion of complex blends well with the scale and character of the surrounding area. The new tower is fairly bland and had it been placed directly at the front of the property right on Delmar it would not work well with its neighbors. Did someone really think that black glass is attractive? While some may not agree with the demolition, beyond the highly ornamented facade the original building was a fairly ordinary red brick box. The demolition, new construction and re-construction in this case allowed for a more urban higher density use (think of how rare this is in St. Louis!) of the site that would otherwise not have been possible. This increase in density is especially desirable with the Delmar MetroLink station one block east. Just returned from Las Vegas and found that the city where Modern style flourished in the 50's & 60's has almost none left. Just last year the lobby of the LaConcha Motel one of the last vestiges of Modernism on the Strip was dismantled and moved away to a place known as the Neon Boneyard, where it will eventually become the entrance and lobby for a museum devoted to neon of the now lost Modern era. Vegas' cool style has been largely replaced by Disneyesque themed fakery attempting to give the impression of being in Paris, Venice, Rome, and even New York City. Here in St. Louis though on Lindell Boulevard mixed among buildings from earlier eras we have a great collection of Modern style from the 50's & 60's. Recently the Vines brothers of STL Style and Jon Swengle produced a great 8 minute documentary about the endangered San Luis at Lindell & Taylor entitled San Luis: This Was The Future. Now the future is up to us. Will we learn from the mistakes of Las Vegas or will we join Sin City and obliterate our links to the Modern era? Last night John McPheeters left a lengthy comment offering some clarifications regarding my post about their recent demolitions. First, I was incorrect in showing the gravel lot east of their main building as being owned by Bowood. 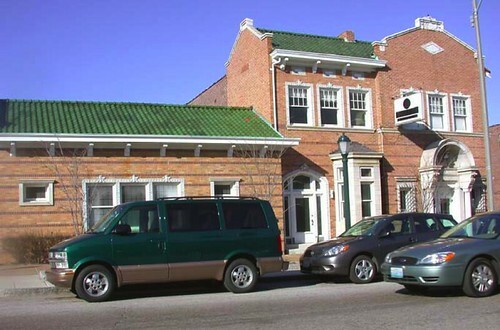 It is owned by the Most Worshipful Prince Hall Grand Lodge, which is located further east on the same block. Second, Bowood does not intend to demolish 4621 Washington, the stone bay fronted home that is part of a row of alternating matching houses. Revised Bowood ownership. Future new residential is shaded yellow. This is a big relief, as demolition of this house or any additional homes in this magnificant row would be devastating. McPheeters indicated that he had recently installed a new roof on the building, restored the Jefferson window over the porch, and that renovations would continue s "funds are available". It would be helpful though to board-up the missing windows on the second floor to keep blowing rain out of the house. The windowless look makes the house look like a forlorn Blairmont property waiting for the final curtain call. McPheeters also mentioned that new presidential development would eventually occur on the north side of Washington on the vacant lots. This is also a good sign as it seemed fairly extreme to expand the Bowood business both north and south. 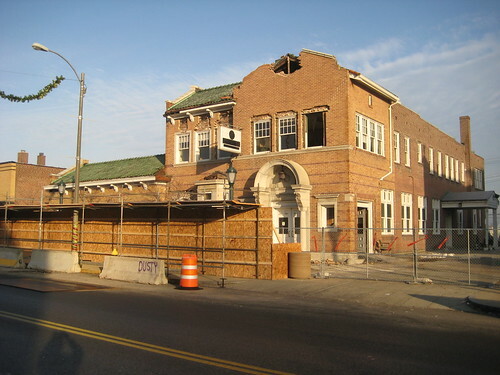 He mentioned that the City condemned 4569 Washington after a partial collapse of the west wall, but I find it interesting that Bowood's main building on Olive was also "condemned for demolition" by the City in January 2005, yet they moved forward with renovation. McPheeters ended his comments with excuses for demolishing 4608 Washington, saying that the house was "severely compromised by neglect over the decades and had become a hazard to life". Somehow I find this to be a bit of an overstatement, as I have seen homes in far worse shape renovated, including farther east on the same block. Interior shot of 4608 Washington during demolition... "a danger to life"?? Thursday morning I was photographing Bowood Farms' demolition of 4608 Washington when I got that erie sensation that something was missing. As I was photographing the homes and and large lot across where a gas station had been I realized that the 3 story house with the odd looking roof line was gone. It had probably been a year or so since I had been on that block and I could not remember its exact location, but it was definitely no where in sight. I noticed that the lot between the former gas station and the large 2 1/2 story home to the east looked like it had been recently graded and surmised that the home had been located there. The vacant lot (behind the tree) where 4569 stood. Since Bowood owns the large lot next door, I suspected that they had bought the home and had it demolished. Later, I checked the City's property database and confirmed my suspicions. 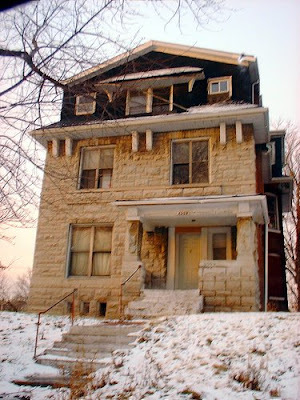 John McPheeters, Bowood's owner had acquired 4569 Washington in November 2005 and applied for a demolition permit on January 15th of this year. 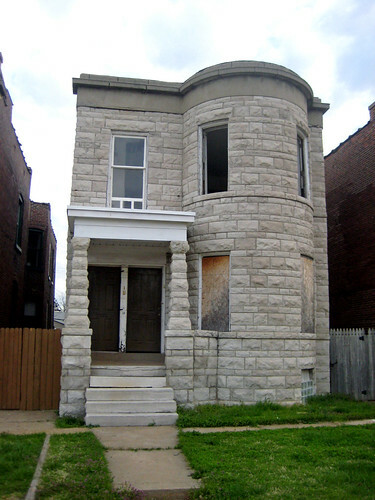 The building data, which is usually taken off the site after demolition showed that the 3,522 square foot home had been built in 1892. A later alteration to the third floor accounts for the odd roof line, which would have likely been a hipped originally. Despite the alteration, the home was in sound condition, and a candidate for renovation, not destruction. including 4569 Washington and 4608, now under demolition. 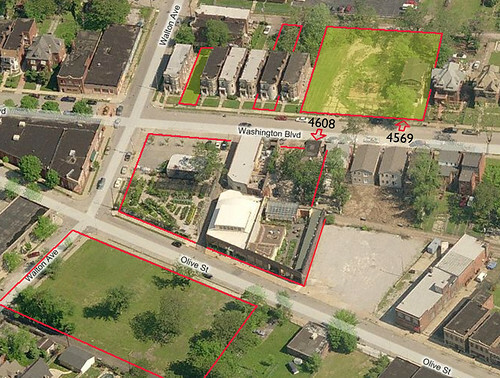 In 2006, three blocks of Washington between Pendleton and Walton had been proposed to be included in an expansion of the adjacent Central West End Historic District. 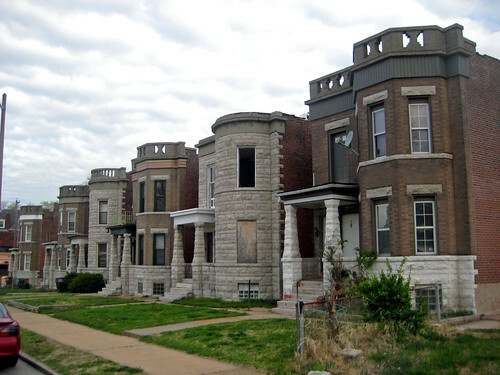 Unfortunately Alderman Terry Kennedy requested that they be removed from the expansion of the local district, leaving the blocks historic homes open for demolition at will. 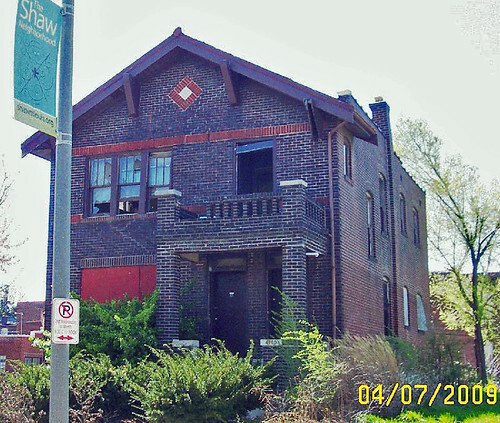 Last month, when the Preservation Board took up review of 4608 Washington, currently under demolition, they ruled that their jurisdiction did not apply, since the block had been removed from from the proposed district expansion. According to the Board Agenda, the entire expansion could be in jeopardy due to the removal of the Washington blocks. I am not sure why 4608 went before the Preservation Board but 4569 did not. 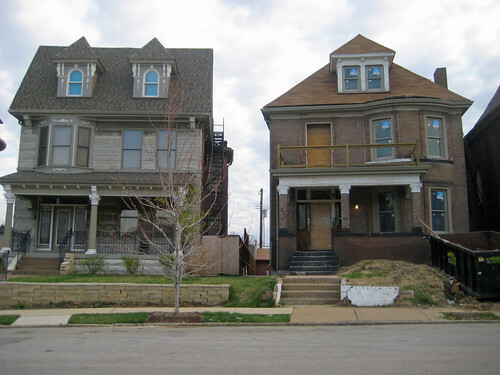 Beyond the two historic homes already lost, Bowood owns 4621 Washington, one of a striking row of alternating stone and brown brick homes with two story front bays. They also own another vacant lot in this row where a matching stone fronted home had been demolished prior to their acquisition, which leads me to believe that Bowood intends to eventually acquire the entire row. Does Bowood plan to demolish the home and eventually it's neighbors? Apparently no one knows. The business has been given two demolition permits without any clear plan of what they ultimately have planned for the area. They have applied to build a greenhouse on some long vacant lots on Olive south of their main building, and have indicated that they would use 4608 for storage and display of landscape materials. What is to occur to the north is unclear. window over the porch, the last one intact in the row. It is unclear to me if the expansion of a nursery would fall within the allowed uses, but this seems worthy of questioning. 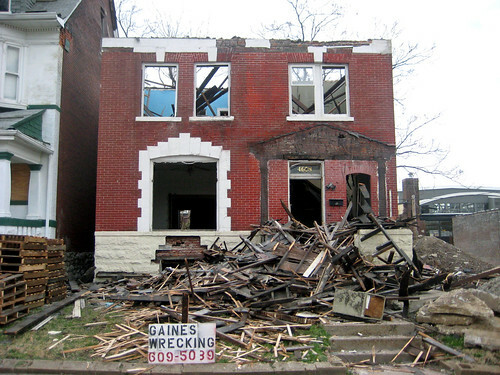 In any case, the City of St. Louis needs to stop handing out demolition permits without firm redevelopment plans. renovated without the use of Historic Rehabilitation Tax Credits. If Bowood does need further space to show and store landscaping, how about using the large parking lot east of their building. Do they really need that much parking? With ownership fronting Washington, Walton, both sides of Olive, as well as owning half of Walton south of Olive which has been vacated (shortsightedly severing ties with the heart of the CWE to the south), Bowood should have plenty of street parking to serve their clientele without the need for an off-street lot. Bayer's Garden Shop on Hampton Avenue, where we will be returning for all of our future gardening needs, seems to get by just fine without any off street parking. 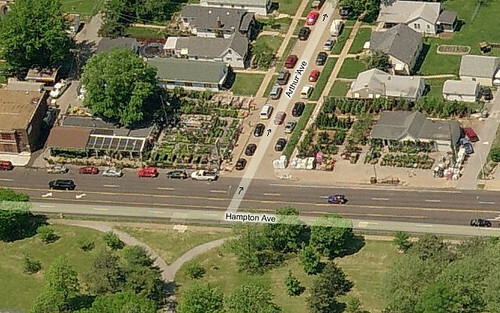 Bayer's Garden Shop on Hampton has no off street parking. Next Tuesday, April 7th, University City voters will go to the polls to consider a $53.6 million bond issue for it's public schools. 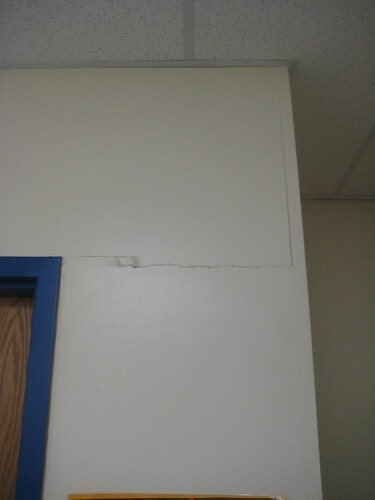 There is no doubt that the school district's buildings need improvement. Like in many school districts basic maintenance and upkeep to University City Public Schools has not kept up with the need. Several schools also need additional space. This however is not a good excuse to waste tax payer money to demolish two historic structurally sound and functional schools to build new facilities in their place. If this sounds like a reoccurring theme, it's because the St. Louis Public School district is trying to do the same exact thing. 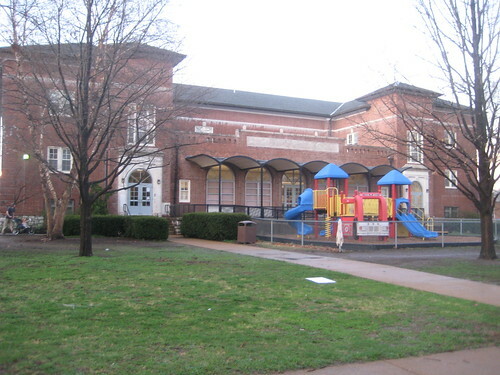 Last Tuesday evening after returning from Jefferson City, lobbying for historic tax credits, I toured Pershing Elementary School, one of the buildings proposed for demolition at an open house that was held to show the condition of the building. The Ittner designed school built in 1922 is in need of maintenance, not necessarily replacement. Overall the building is in good shape. The building has a 10 year old addition to the rear with several classrooms. Upon entering the building, visitors were shown a poorly produced propaganda video. The video talks first about the great history of U-City's school buildings, then rolls into the "problems" that they are using to justify demolition and replacement. The "problems" included a leaking or clogged downspout, a ceiling tile that had collapsed because of a roof leak, and several photos of minor hairline cracks in the walls. As we walked around the building, the tour leader pointed out the hairline cracks and ceiling tile issues. In the newer portion of the building more hairline cracks were pointed out on one wall, which appeared to possibly have a poor drywall taping job. This condition was isolated to one area. After these comment, I said thanks and started looking around on my own. I spoke to a few teachers in the older portion of the building and asked if they found their classrooms inadequate, and none said yes. One mentioned having trouble closing a window, but I noticed that the windows are insulated replacements, probably about the same age as the newer addition. 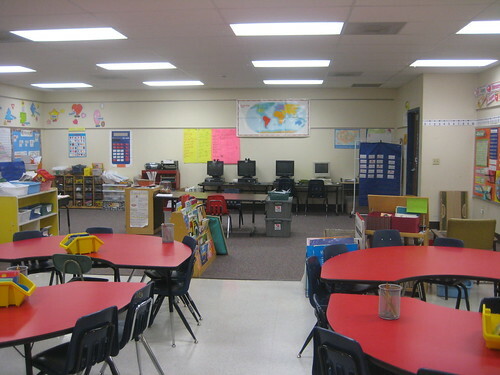 The kindergarten room. 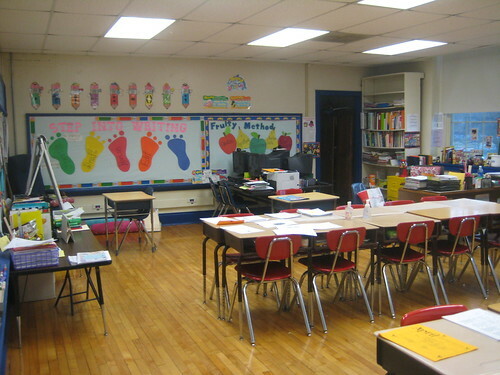 The teacher said she is very happy with the room. 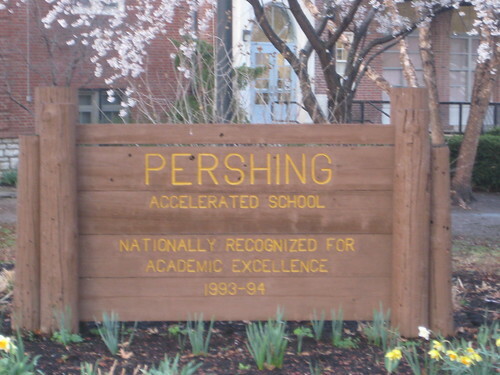 Like any older school building, Pershing likely could use a renovation including upgraded mechanical, electrical and plumbing systems. If there are programmatic spaces that are inadequate, an addition could accommodate these areas. Several other district buildings including the historic Flynn Park Elementary (which was built only one year after Pershing) are to be renovated and added to as needed as part of the bond issue. Hard to believe that can happen in such an old building, right? 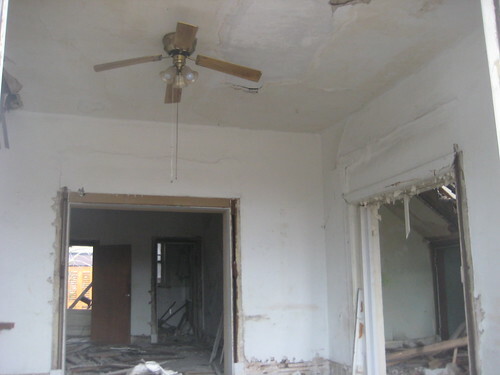 Renovating a school building usually can be accomplished for one third to one half the cost of demolition and total replacement. To appease residents who are concerned about the loss of the historic building, U-City is proposing to build a near replica of the original building, although the rendering shown on the school district's site seems to be missing one important element, namely front doors. 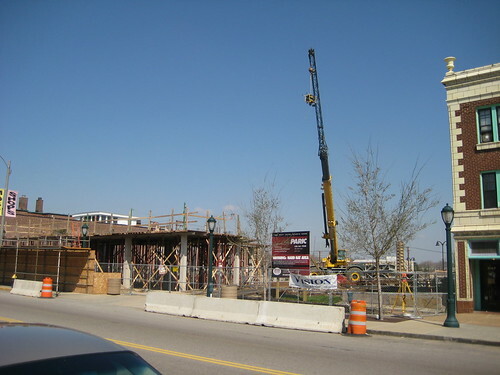 Another section of their site indicates that they will be going "green" with the new buildings, but there is no greener way to build than to re-use and renovate an existing building.